°OMG I’m so relived today. Remember a couple of day ago in my last Reader’s Questions post where I confessed that I’d recently had two failed double batches of Clarity? The ones that looked like this when cut? So, I left the moulds in there for an hour, then turned off the heat and left them there for another hour. Thanks for reading – back tomorrow! Back in mid-September I put out an appeal to you lovely people for questions to help me with topic ideas for Blogtober and I wasn’t disappointed. Rather than try to answer them all in one post, there will probably be three posts in total during Blogtober – this here being the first. Question 1 came from Claire of Saponista, who asked ‘What is your favourite soapmaking oil, and why?’ Without a doubt, my favourite soapmaking oil isn’t actually an oil, it’s a butter – cocoa butter, and I can’t imagine making soap without it (that’s a bit of an exaggeration of course – I made castile recently, and there ain’t no cocoa in that, but as a general rule each batch I make contains 10% cocoa butter) Cocoa butter adds skin loving properties to soap, and because I choose not to use palm oil, it also helps a lot with making a nice hard bar. Bath bombs, on the other hand, don’t go out unless they’re pretty much perfect. It took me a while to be able to get the mixture to the right consistency every time, but I think I’ve cracked it and it’s rare that I get bombs that aren’t pretty good (but the odd one that doesn’t quite make the grade will always find a place in my kids’ bath!) Interestingly (and this was part of Jo’s question), although I live in a particularly wet part of the country, I haven’t found that the climate or weather conditions have any effect whatsoever on my bomb making abilities. This seems to go contrary to what I’ve heard so many others say about bath bomb making, but there you go, that’s my experience. 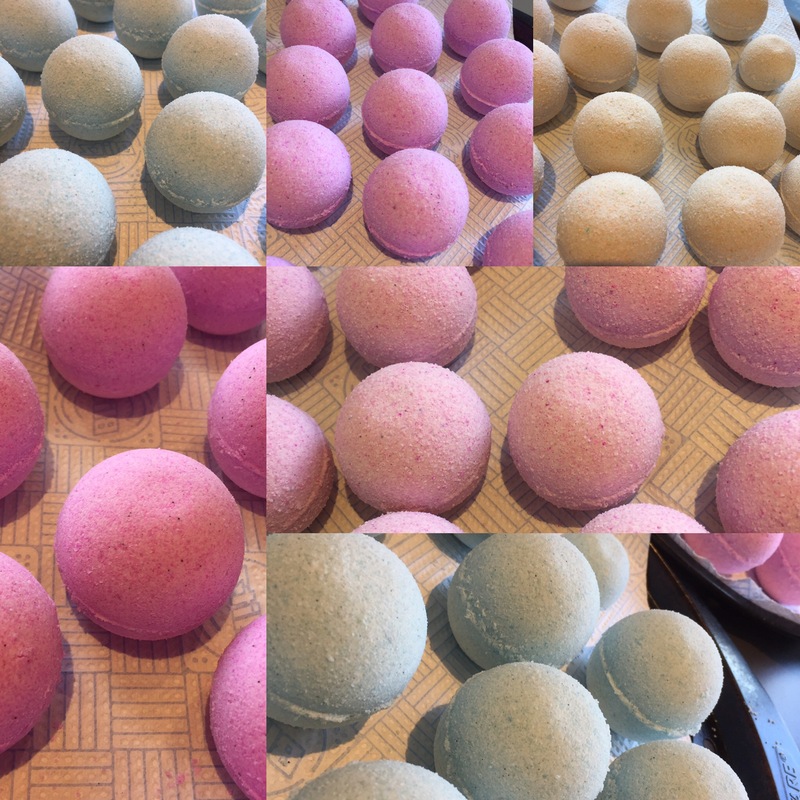 Jo – I will write up some of my top tips for bath bomb making in a near-future post – I promise! Question 4 is another one from Barb – what music do I listen to when soaping? Actually, it’s not always music. I LOVE the radio, and I’m a big fan of BBC Radio 4. It keeps me up to date with current affairs and has the most insanely interesting programmes, on all subjects under the sun. When I do listen to music, it’s inevitably rock music; contemporary rock, 70s rock, or any era in between, including the occasional trip down memory lane to my uni days with 1990s indie rock.